What are days and nights like on a Cunard ocean liner? A sensational variety of engaging options await. There are enrichment programs to enlighten your mind, spa treatments to rejuvenate your body, and an international mix of new acquaintances with whom to mingle. At night, you'll have the rare opportunity to dress up and step out for an evening of dancing, theatre, a lavish formal ball or live musical entertainment. The possibilities are nearly limitless. Internet Café - There is a computer center on board that offers internet access via PC. Guests with laptops may access the web via the ship's wireless network, which is available in every stateroom and many public rooms. Charges apply for these services. Infirmary / Medical Center - There are basic medical facilities on board equipped to deal with illness and accidents, and are not intended to provide ongoing treatment of pre-existing conditions. If you anticipate a need for medical services aboard the ship, your special requirements must be cleared in writing with Cunard before your booking can be finalized. Pregnancy Policy - Because onboard medical facilities are limited and shoreside medical care is not always readily available, Cunard will not be able to carry guests who will be 24 weeks or more pregnant by the end of the intended voyage. Smoking Policy - Smoking is not permitted in any of the public rooms, with the exception of Churchill's Cigar Lounge and designated areas on the open deck. Smoking is allowed in all staterooms and stateroom balconies. These regulations may be subject to further change in the future. Special Dietary Needs - Advance Notice Required - Guests with special dietary needs must advise Cunard at the time of booking or, at the latest, six weeks prior to sailing. Every effort will be made to comply with such requests. Once on board a Cunard ocean liner, you'll soon find yourself comfortably settled in your tastefully appointed stateroom. From the elegance of standard staterooms that inspire a relaxed sense of belonging to some of the grandest suites and penthouses at sea, a selection of accommodations lets you define your own experience and ensures you'll feel at home your entire voyage. 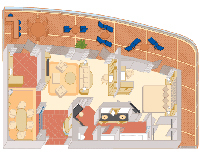 +Indicates staterooms for sailings starting April 7, 2013. Information provided within these pages has been updated as of May 2012. While we do our best to ensure that stateroom descriptions and deckplans appearing in this website are complete and accurate, we cannot be responsible for inaccurate representations, which may or may not be under our control. Please reconfirm stateroom accommodations and deck placement prior to booking.